The Chorus asks the audience members to use their imaginations to make up for the play's deficiencies. Two churchmen plan to distract the king from passing a law that will cost them money by starting a war with France. King Henry is convinced of his right to be King of France. The Dauphin provokes him and he declares war. The Chorus reveals that three noblemen are plotting with the French to kill King Henry. Nym and Pistol settle their differences. Falstaff is very sick. King Henry reveals the traitors' plan and punishes them, then leaves for France. Falstaff dies. The French discuss their strategy. The English deliver an ultimatum. King Henry arrives in France. He doesn't like the French king's counter-offer so he besieges Harfleur. King Henry encourages his soldiers to make one more effort to capture Harfleur. The Boy considers leaving his master. Fluellen and Macmorris argue. King Henry threatens further bloodshed. Harfleur surrenders. The French Princess Katherine learns some English words. The French decide to fight and to ask King Henry for a ransom. Fluellen finds out Pistol is a fraud. Bardolph is executed for theft. The French challenge the English to battle. The French are eager for battle. The Chorus describes the English camp. King Henry walks around camp cheering up his soldiers. King Henry talks to different members of the camp. He quarrels with a soldier and they promise to fight. The French prepare confidently for battle. King Henry encourages his men and refuses to pay a ransom for himself. Pistol takes a prisoner. The Boy reveals that there are only boys guarding the luggage. The French are losing and are in despair. Suffolk and York are dead. The French rally. King Henry decides to kill the prisoners. The French kill the boys guarding the luggage then surrender. The King gives Fluellen the soldier's glove to wear. The soldier hits Fluellen and the king rewards him. The dead are counted: there are many French and few English dead. King Henry returns to England, where his people celebrate his return, then goes back to France to make peace. Fluellen beats Pistol and makes him eat a leek. Nell is dead so Pistol decides to become a professional criminal. Katherine agrees to marry Henry. The peace treaty is signed. Henry dies young, France is lost, and civil war begins. Doyle, Clio. "Henry V Translation." LitCharts. LitCharts LLC, 11 May 2014. Web. 21 Apr 2019. Doyle, Clio. "Henry V Translation." LitCharts LLC, May 11, 2014. 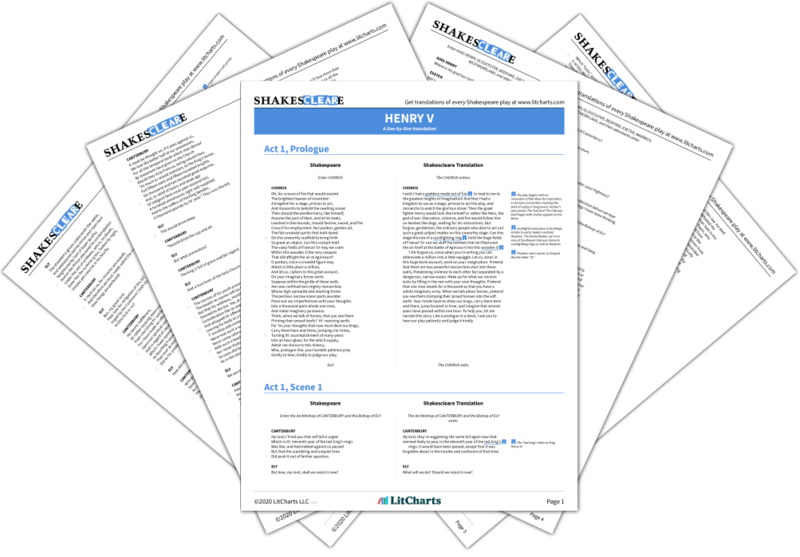 Retrieved April 21, 2019. https://www.litcharts.com/shakescleare/shakespeare-translations/henry-v.